Go check today's software Giveaway of the Day | Need to check Philly Traffic? Welcome to my Ham page. My name is Lee Bacon and my call sign (obviously) is KB3MUZ. I am currently a general-class licensee. I received my ticket in November 2005, as a technician. I upgraded to general class in April 2007. I am usually found on the BEARS repeater system, but can also be found on simplex frequency 146.580 MHz. If you would like to know a little bit more about me, you can find out here. Since becoming a HAM operator, I have met and made friends with quite a few great people : Lou (N3TMA), Larry (KB3MOY), Stan (KC2HDR), John (N2HRY) and Steve (N3SP) to mention a few. It is all thanks to JJ (N3KMG) who has taken on the role as my "Elmer." In my "shack" (which right now is my desk), I am using an Icom 2700H dual band (2m/70cm) transceiver (purchased Jan-2006) and a Icom 706 MkIIG, which covers HF (160 - 10 m), 6m, 2 m and 70cm. 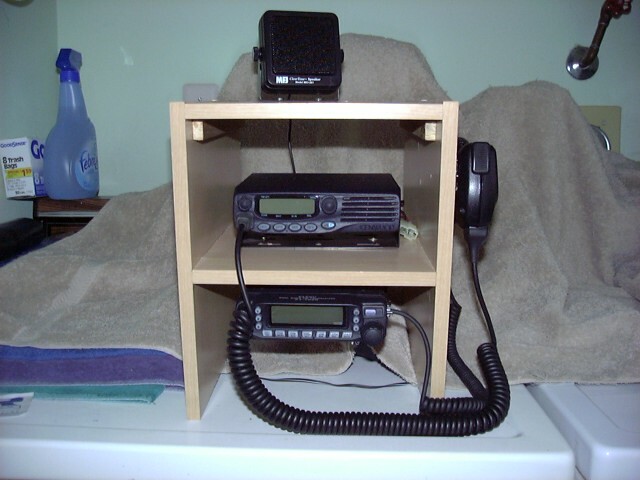 The 706 was added to my shack in Fall of 2007, which replaced a Yaesu FT-100, bought in May/2006. The 2700-H is attached to a Jet Stream JTB1, , dual-band antenna. The 706 is currently talking thru a Comet GP3. Also added to my rigs (thanks to Pete, KB3OIC) is an IC-3200A, dual bander. This one I have set up in my excercise room. It is attached to a DBB-5 dual-band base antenna made by the Lakeview Company. For HF work, I am using a home-made G5RV, thanks to JJ. I am partial to Icom radios. Icom is basically what I got my start with, and you know what they say about your first. JJ had initially lent me his Icom IC3200A mobile radio, and his IC-02AT 2m HT (two excellent radios). The 2700 and the 706 are powered by a Pyramid PS-21KX power supply. I purchased this at the same time I did the Ft-100. The 3200 is powered by a Radio Shack 15amp power supply. My first (officially mine) radio was the Icom IC 32AT, dual band HT. I bought that off EBay for $68. It is a good solid radio which I still enjoy using. I also purchased from Tom (W2XQ) a Yeasu Vx 5R, tri-bander (6m/2m/70cm), which I also enjoy using. In 2007, I purchased a Kenwood THF6A, tri-bander HT. I didn't really need it, but it was the right price, and it gave me limited 220 capability. There will be more radios coming, of course, as I have been bitten by the HAM bug. My XYL can curse JJ out for pushing me into this. In late 2006, I joined the Warminster Amateur Radion Club (WARC). With them, I have performed a few public service events, where the hams provide needed radio communications. In 2009, I was asked to be one of their net control operators for their Wednesday Night Social Net, which takes place every Wednesday evening at 8pm. I am net control on the 2nd Wednesday of each month, so tune in. The net is run on the club's two meter repeater (147.090 MHz) and their 70cm repeater (443.950 MHz) and is linked to the B.E.A.R.S 2-meter repeater (147.300 MHz). I am located in Bensalem, which is located in the very southwest corner of Bucks County, PA. Right on the Philadelphia border. You can reister your presence on my FRAPPR MAP. I always enjoy seeing who is visiting my site. UPDATED 12/03/2010: This map is a overall view of hams I have talked with, on a regular basis, either by simplex or repeater. If you would like a full-sized view, click the map itself. Now, there are certainly BUNCHES of more repeaters in this area, but these are the ones I listen to and occasionally jump on. The "*" indicates the ones you will more than likely find me on. Weekly reporting of news in the Amatuer Radio field. Newsletter for the Scanner enthusiast. AC6V's Home-brew antenna site - excelent information! Daily solar activity as well as other Space-related information. A virtual wealth of knowledge and great links on this site. Wan an nifty idea for your shack? Check out KC2IZZ's "Shoe-shelf design"
This you may, or may not, be interested in. I decided to keep an Online log of my ham contacts. I could list them here, but I am hoping the list gets rather long and don't want to put it all on the main page. plus, it give you more pages to opemn up.